“Brilliant, Exciting, Innovative, Quirky, Acclaimed .” Those words describe my impression of this museum. I'm Bob Radcliffe, membership VP for the MIT Club of the Delaware Valley. 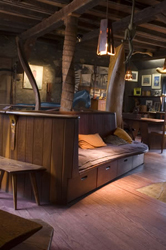 November 14, join with MIT Club of the Delaware Valley in a visit to a museum that was the home and studio of Wharton Esherick, internationally known sculptor. 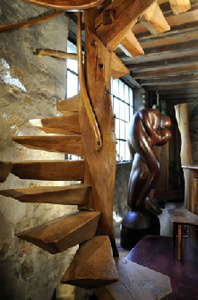 Mr. Esherick became renowned for his work with wood sculpture in the last century, and received international acclaim for his work exhibited at the New York World’s Fair in 1939. The Wharton Esherick museum is located on a wooded hillside near Valley Forge Park. The museum has both indoor and outdoor exhibits, so dress for the outdoor weather. The museum buildings are wheelchair accessible on the first and second floor only. In some places there may be a tight fit in narrow rooms if you use a wheelchair or walker. We will tour the museum in groups of 10 people. We will be limited to 30 attendees, so register early to get a spot. Parking on museum grounds will hold up to 10 cars. If more parking is needed we may park along Horseshoe Trail Road near the entrance to the Museum. It is a short 50 yard walk to the visitor center from the road.